Generally speaking we will aim to maintain a cadre of up to 6 or 7 or so trained responders that are each able to provide and maintain an average of at least 20-hours a month ‘on call’ to the South Central Ambulance Service (SCAS). What is the R1r aim? The R1r aim is to respond to the community in and around Princes Risborough as much as possible when tasked by the EOC because we are likely to arrive before an available ‘rapid response’ car or emergency ambulance. Attending first responders from the community are always backed by a rapid responder or emergency ambulance crew (except for ‘concern for welfare’ calls and ‘non-injury falls’; both of these types of incidents are currently ‘on trial’ in Buckinghamshire. There are some 8,500 people living in Princes Risborough and another 8,500 or so in the surrounding villages. Calls can be to patients who live, work, visit and play in the Risborough area. R1responders are trained by the NHS … are part of the NHS for ‘999’ and other emergency calls … but are not part of the NHS when it comes to money! Hence our reliance on funding from across the community for the R1r account administered by the South Central Ambulance Charity (recently taken over from the SCAS League of Friends). R1r achieved a viable initial capability early in 2014 with 5 trained R1responders, using their own cars, without sirens and without blue lights, and 5 ‘responder kits’. 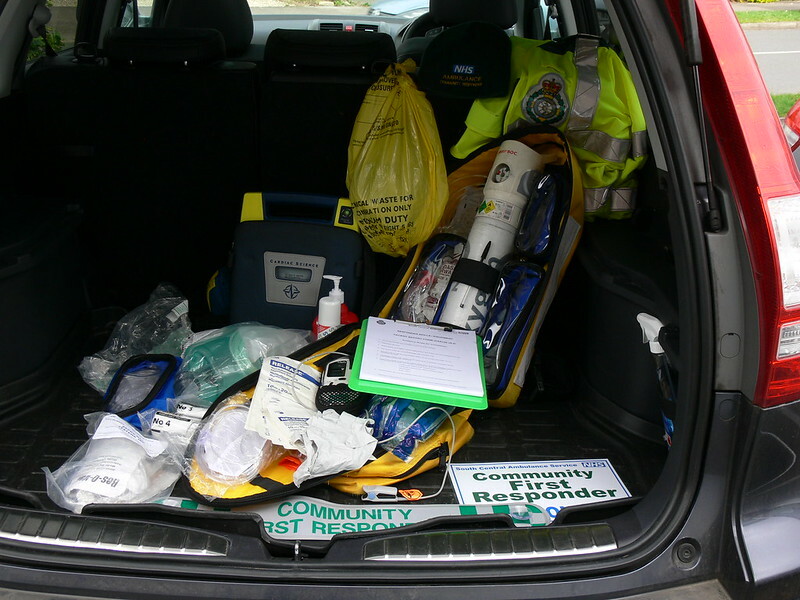 Additionally since Apr 2015 SCAS insured R1r drivers have been operating a new ambulance looking Community Response Vehicle (CRV) provided by Risboro’ Garage; this Risborough Area CRV now has a dedicated ‘responder kit’ and since Oct 15 is fitted with an ambulance tasking, routing and tracking system called ‘Terrafix’. Recently a further local response vehicle (a Fiat Panda Cross) has been allocated to Haddenham.